Structure My Deal tools are complete — you're ready to visit Husker GMC! What's New for the 2019 GMC Terrain? 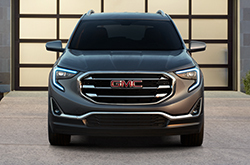 In 2019, there are a number of great new features to look forward to with the GMC Terrain. This versatile crossover SUV proves to be more popular than ever, with sales of the Terrain jumping to an unprecedented 50% within the past year. 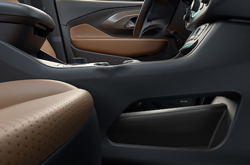 The 2019 Terrain keeps the sales momentum going with an attractive new exterior color choice called Smokey Quartz Metallic and accent packages to give the exterior an even more eye-catching look. The interior features a variety of new tech elements that make the Terrain safer and more enjoyable to ride in than ever before. 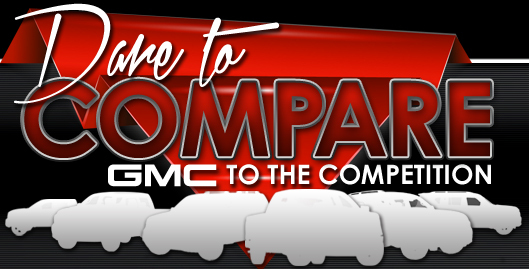 Along with new standard amenities for the trim levels, you can give your GMC a custom look with a number of available packages. There are four trim levels available in the 2019 GMC. They include the base "SL" model, the "SLE," the "SLT," and the Denali. Both the SLE and the SLT are available in both standard gasoline and diesel versions. Starting with the base model, you'll be able to get just the look you want with an impressive count of eight exterior colors. There are three interior color schemes available to pair with your GMC's original look. Looking at the base model, the first thing you'll notice is a beautifully crafted grille that gives the front end a more distinct and elegant look. Bright LED lights in the brand's signature "C" shape make the Terrain highly visible. On the inside, a keyless remote entry system makes it easy to jump in the car and drive away. A seven-inch infotainment screen offers audio and app connectivity when you need it. Climate control and assist handles on the cabin doors are other notable standard amenities. Connectivity comes in the form of Bluetooth and a Wi-Fi hotspot. Moving up to the SLE, you'll have the option to upgrade to an eight-inch infotainment system with navigation. Heated seats, a heated steering wheel, and rear backup assistance are other available amenities in this trim. The SLT has a standard eight-inch infotainment center. Heated front seats are standard, while parking assistance, a heated steering wheel, and low-speed automatic braking are available amenities. Rounding out this trim's amenities are standard dual-zone climate control, a 110V power outlet, and a 12V auxiliary power outlet in the cargo area. The Denali comes standard with all the previous amenities plus an eight-inch infotainment screen with navigation. It also comes with a 4.2-inch driver information center and a heated steering wheel. Beneath the hood, there are several engine options for the GMC Terrain. The first is a 1.5L, four-cylinder, turbocharged engine that is standard in most trim levels. The second is a 2.0L, four-cylinder, turbo-charged engine. This engine comes standard in the Denali, and it's available on the other trims starting from the SLE and up. Performance brake lining makes for a smoother ride on all trim levels. Both engines are paired with a nine-speed automatic transmission. Along with the standard gasoline engines, there is a 1.6L, four-cylinder diesel engine available on select models. Safety is prioritized in the GMC Terrain, which has a wealth of standard and available safety amenities. Airbags throughout the cabin are standard in all trim levels of the Terrain. Another standard feature, to the delight of parents, is a teen driver system that records the driving habits of a younger driver. The Terrain is also offered with a variety of safety technology features including front pedestrian detection, lane-change alert, lane departure warning, adaptive cruise control, and blind-spot monitoring. 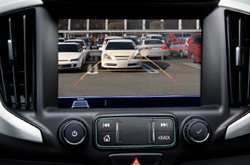 Forward collision alert, distance indication alert, and automatic parking assistance are available on the higher-level trims.